Synopsis: Their names were Bob Palmer, Gordy Cox, Tim McCoy, and Chuck Vervalin, and in 1941, when they joined the navy, they were not trying to prove their patriotism—they were just looking for a job that would provide "three hots and a cot." But on April 22, 1943, the war took a terrible turn for them. While on patrol deep in enemy waters, their submarine, the USS Grenadier, was torpedoed and sent crashing to the ocean floor. Listed as lost in action and given up for dead, all four had in fact miraculously escaped the ship, only to be captured by the Japanese. The four men spent the next two and a half years as POWs, enduring barbaric torture and starvation, unable to communicate with their wives and families. When they were freed, they were forced to find a new kind of resilience as they struggled to resume their lives in a world that seemed to have forgotten them. 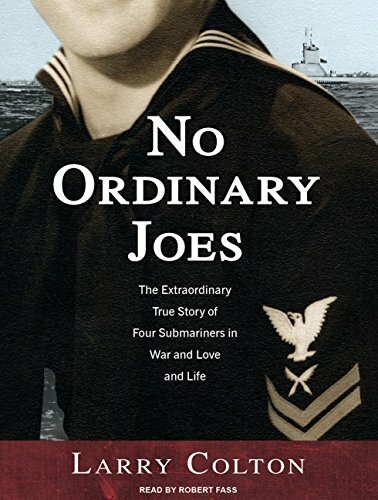 In Bob's case, it would be more than thirty years before he was reunited with the love of his life—the wife who had left him for a well-bred naval officer after he came back from the war.By turns panoramic and intimate, No Ordinary Joes shows us, through the lives of four "ordinary" men who endured extraordinary circumstances, the tragedy of war and its aftermath, and the restorative power of love. Review&colon; "[I] am reading "No Ordinary Joes". Should have had a medical checkup before I started it. Colton makes us fall in love with these guys, then puts our hearts in harm's way. It's lovely and ghastly and extremely powerful. His best yet." --Katherine Dunn, National Book Award finalist, author of "Geek Love"
""No Ordinary Joes "is a marvelous treatment of a special time in American history, as well as an up close and personal look at the devastating impact that war can have on the personal lives of those involved in it. Let's have a twenty-one gun salute for Larry Colton!" "Larry Colton's Ordinary Joes are just like us, yet they endure what we could never imagine, and are ennobled in ways they themselves might not claim. Intimate and epic, unblinking and even-handed, Colton's engrossing story strips sentimentality and cliche from our notion of hero." --Ron Shelton, award-winning screenwriter and director of "Bull Durham, White Men Can't Jump "and "Tin Cup"
"[I] am reading "No Ordinary Joes." Should have had a medical checkup before I started it. Colton makes us fall in love with these guys, then puts our hearts in harm's way. It's lovely and ghastly and extremely powerful. His best yet." " No Ordinary Joes "is a marvelous treatment of a special time in American history, as well asan up close and personal look at the devastating impactthat warcan haveon the personal lives of those involved in it. Let's have a twenty-one gun salutefor Larry Colton! Larry Colton s Ordinary Joes are just like us, yet they endure what we could never imagine, and are ennobled in ways they themselves might not claim. Intimate and epic, unblinking and even-handed, Colton s engrossing story strips sentimentality and cliche from our notion of hero. --Ron Shelton, award-winning screenwriter and director of "Bull Durham, White Men Can t Jump "and "Tin Cup"
"[I] am reading No Ordinary Joes. Should have had a medical checkup before I started it. Colton makes us fall in love with these guys, then puts our hearts in harm's way. It's lovely and ghastly and extremely powerful. His best yet." No Ordinary Joes is a marvelous treatment of a special time in American history, as well asan up close and personal look at the devastating impactthat warcan haveon the personal lives of those involved in it. Let's have a twenty-one gun salutefor Larry Colton!